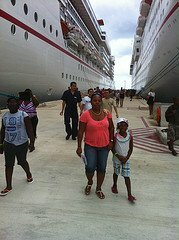 Your family will simply enjoy any Carnival Dream cruise to the Caribbean. The ship is quite impressive and will leave you wanting more. The Dream is among Carnival Cruise Line's biggest ships and features state of the art amenities for all to enjoy. 1. "Service was spectacular, excellent in the dining room, at the bars, entertainment was great, staff was amazing. Couldn't have asked for better! " 2. 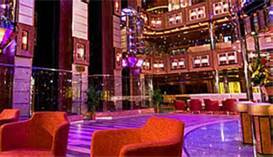 "A beautiful ship with many bars and dining options. Entertainment was great." 3. "We traveled with someone who uses a cane. The staff took immediate interest in him." 4. "The water-park was amazing - the staff especially friendly." 3. "Food was below par. Long wait for elevators." You will be awed when you first get on board. The ship has an amazing atrium and the "new" Ocean Plaza where you can relax, grab something to eat, listen to music or just watch your fellow passengers. The Dream has extensive children's facilities, which include expansive play areas and a gigantic Carnival WaterWorks aqua park. The are scenic whirlpools extending over the ship's beam and a variety of new stateroom categories, especially some catering to families. Past guests remark how more spacious cabins are on the Dream. At night go dancing, watch movies under the stars on a giant Times Square like TV screen, or enjoy a professionally choreographed theater production. I could not end this without saying that there are many dining options available and your family members will find something to suit their tastes. There is just too much fun stuff to do on a Carnival Dream cruise. At the time of updating this page, the Dream is based in New Orleans and offers cruise packages to the Eastern and Western Caribbean. 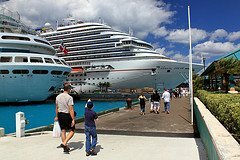 The ports of call included in a Carnival Dream itinerary are among the hottest spots in the Caribbean. Expect to visit places like Key West and Nassau on an Eastern Caribbean cruise and ports such as Belize City, Cozumel, and Mahogany Bay on a Western Caribbean cruise. The Dream offers 7-day cruises to the Caribbean, and your family should be able to find a cruise year-round. Check with your Travel Agent for available Caribbean sailings. There are 7-Night Eastern Caribbean cruises to Key West, Nassau and Freeport, Bahamas. There are 7-Night Western Caribbean cruises to Belize, Cozumel and Mahogany Bay (Honduras). There are 7-night Western Caribbean cruises to Belize, Costa Maya, Cozumel and Mahogany Bay. Note: All itineraries above are subject to change, as the cruise line re-positions its ships at will. As noted before, a Carnival Dream cruise is available just about anytime of the year. Get with your Travel Agent, or use the search bar below to book. 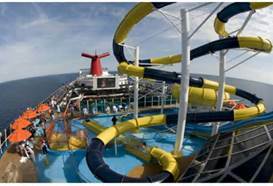 Your family will have fun-times on board this remarkable Carnival cruise!